The User Search screen displays user metrics and provides mutilple options for an administrator to search and modify user information. 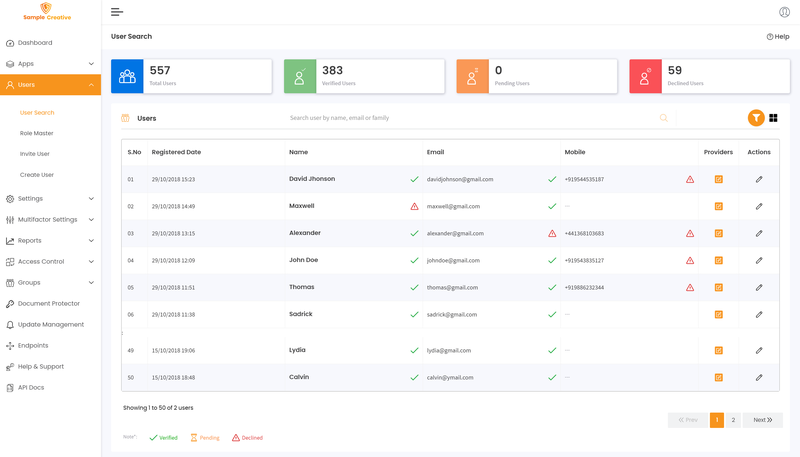 Login to the Administrator dashboard. On the left navigation panel, click Users . From the Users menu, click User Search. The screen below shows the User Search screen. Total Users The total number of users registered to the cidaas portal. Verified Users The number of users that have been verified by the administrator. When an administrator verifies a user account, the status for the user is set to Verified. Pending Users The number of users who must be verified by the administrator. If the user registration requires an Administrator verification, then the user status is set to Pending. Declined Users The number of users who are not in active status. An Administrator can temporarily suspend a user account by changing the status of the user account to Inactive. Note: The user will not be able to login to the cidaas portal in the inactive status. The Search panel, on the User Search screen, allows you to lookup users by their user information such as name, email id and so on. You can also apply search filters based on several search criteria. The screen below shows the Search panel. 1. Search User by Email, Name: Enter name or email id of the user to filter search results by email or name. 2. Search User by Email: Enter email of the user to search. 3. Search User by Given Name: Enter the given name of the user to search. 4. Search User by Family Name: Enter the family name of the user to search. 5. Filter by Provider: Select social providers from the drop-down list of configured social providers to search users. Users who have registered using classical registration will have “your business Portal name” saved as the provider. for.eg. SampleEshop. 6. Filter by the User Status: This drop down contains various status that a User Account can be at. While searching for a user, one can search by this status. Valid user account status shown here are "Pending", "Verified" and "Declined". In addition, one can search by all the above statuses. 7. Apply Date Filter: Select Apply Date Filter checkbox to search users based on the last accessed date. You can select the date from the available options or select Custom Range to select a specific date. The Group & Role Search panel allows you to search for users by their associated group and role in it. Custom Group : If system provided groups are not sufficient to organize access, a rightly privileged user can create Custom Group, the suits the specific requirement. These Groups get then listed in the Select Groups drop down. The screen below shows the Group & Role Search panel. Finding users within in "cidaas Group"
On the Group & Roles Search panel, Select Role for cidaas group. Multiple values can be added to the filter criteria. The User Search Grid displays the list of users that are associated with the role selected. Finding Users in "cidaas Admin Group"
On the Group & Roles Search panel, Select Roles for the cidaas Admin group. When done, all users belonging to this filter criteria will be listed. Custom groups are available in the Group & Role Search panel, when an Administrator creates a group from Manage Groups. On the Group & Roles Search panel, Select Group in the Groups Column. The User Search Grid displays the list of users that match this criteria. Note To add a new group to the search criteria, click the Add Group button. Note: To remove a group from search criteria, click the Delete Group button. The User Search Grid panel on the User Search screen displays the results of a search request. Note: By default the top 50 users are listed on the first page. Click the Next or Previous button to view more users and navigate between the pages. Serial Number Number of user in the sequential order. Registered Date Details of the date and time of the registration of a user. Name Name of the cidaas user. Email The email id of the user entered during the registration to the cidaas portal. Mobile The mobile number of the cidaas user. Registered with Providers Providers with whom the user is registered. Actions ... Provides quick links to complete the administrator role related tasks or actions. Using the Edit User option, you can modify and update the user account details for a user from the User Search Grid panel. On the User Search Grid panel, in the Actions column, click ... for the user whose details you want to change. From the Actions menu, click the Edit User option. To change the user information, modify the required fields shown in the User Details screen. The User Details screen shows the information of a user, whose user account details you want to change or manage. Change the user account information and status such as, activate or suspend a user account. Assign Groups and add or change roles for a user. Reset the user account password. 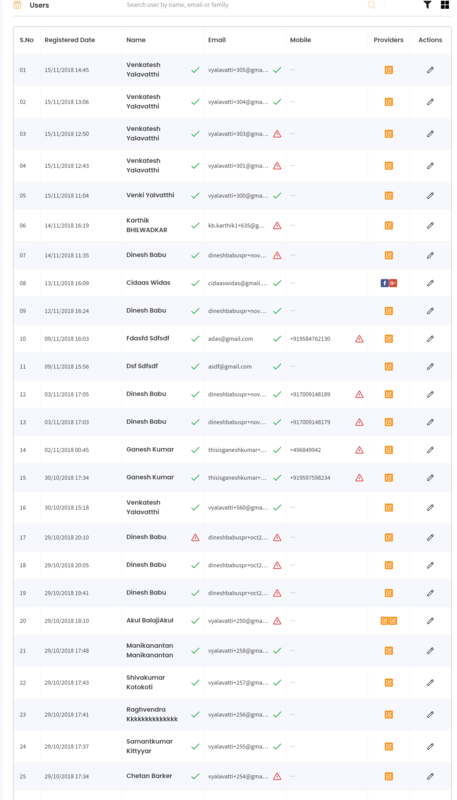 Track the login failures for a user. Remove a user from cidaas portal. The screen below shows the User Details screen. The User Information panel shows the information associated with a user account. The user details parameters are those that are defined during Registration . 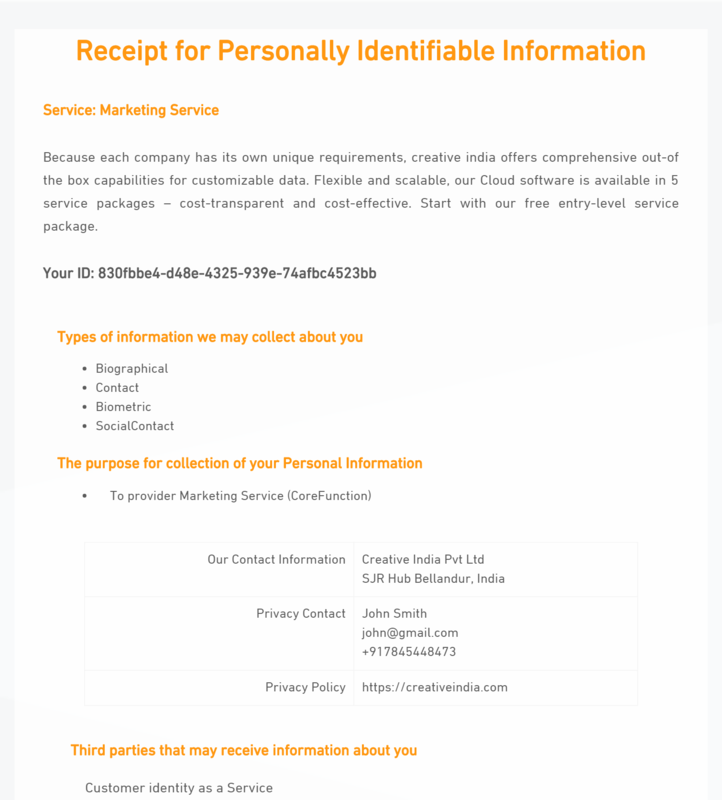 Modify and update email id, given name, family name, city , mobile number, and profile picture of a user. Deactivate and activate a user in cidaas portal. View the email verification status for a user. Id Shows the internal id of a user account in the cidaas system. Note: This field is read-only. Username The username of a user. Note: This field is mandatory for updating the user account information. Given Name The first name of the user. Family Name The last name of the user. City The location(city) of the user. Mobile Number The mobile number of the user. Provider The provider with whom the user is registered to the cidaas portal. Click to add or update the user profile picture. Last Activity On The date of the last login to the cidaas portal. Created On The date on which the user account is created. User Status The status of the user. You can set the status to Inactive or Active status. Click the Click here to Deactivate link or the Click here to Activate link to deactivate or activate a user in the cidaas portal. Email(status) The email verification status of the user. Green color indicates the email is verified. Red Color, indicates email is not verified. Save Saves the updated details for the user. Cancel Cancels the changes made to the user details. An Administrator can manage groups and roles for a user from the User Roles panel. 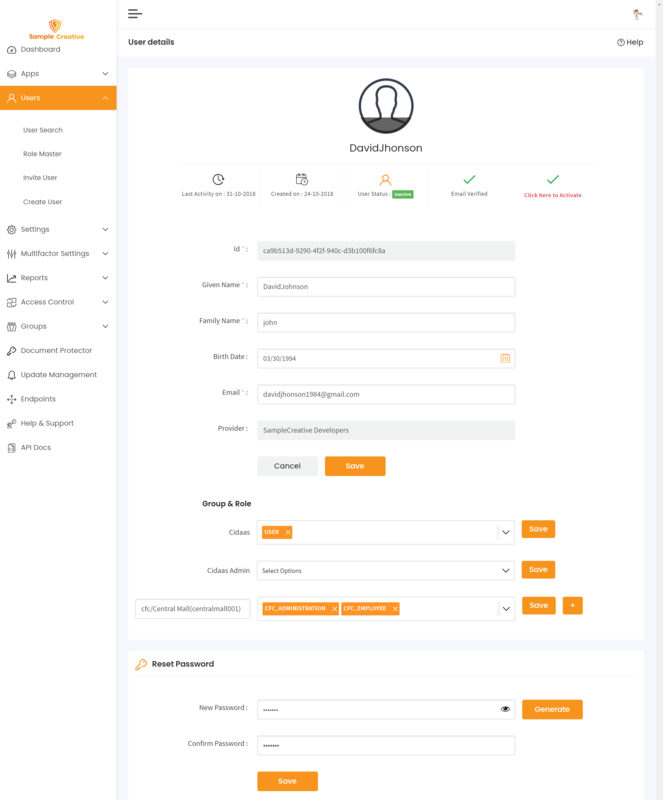 The screen below shows the User Roles panel. For the cidaas group, click Roles. The Roles for the group as configured by the administrator will be displayed. Note: Selecting a role from the Roles drop-down list adds a role to the user. Note: On the role, click X to remove it. From the Actions column, click Save. The role is added to the user. For the cidaas Admin group, click Roles. Note: Click On the role, click X to remove it. 1 . Click Select Groups. 2 . Click to select and add a group from the drop-down list. 3 . The Roles for the group as configured by the administrator will be displayed. 4 . From the Actions column, click Save. The group and role are added to the user. Note To add a new group, click the Add Group button. Note: To remove a group, click the Delete Group button. The Reset Password panel allows an administrator to reset a user&apos;s password. In the New Password field, enter the password. Note: The password in the New Password field is hidden. To view your password, select Show Password. In the Confirm Password field, enter the password again to confirm. In the Reset Password panel, click Generate. Note: A numeric 8 digits password is generated in the New Password field. Note: The password entered is hidden. To view your password, select Show Password. The User Activities panel displays the user activities from the email verification activity till the last activity of the user in the cidaas portal. Note: The refresh button list the available user activities. The screen below shows the User Activities panel. Failure Reason: Short description of the reason for the failed login attempt. Address Info: Details about the location of the user from where the login attempt was made. You can view location details such as city, state and country. Browser: Details of the browser used for login by the user. OS Name: The name of the operating system used by a user to attempt login. Failure Time: Date and time information about the failed login attempt. Here administrator can track what kinds of devices (mobile/personal computer) can access their account information. A mobile device such as an iPhone, iPad, or Android smartphone will present you with a few details including when it was last synchronized with your account, what web browsers may have been used, and the exact manufacturer and model of the device. You will also be presented with an option to find the device if you have lost it. A personal computer such as a Windows PC or Mac will present you with a few details including what web browsers may have been used to access your account and a list of the most recent locations it was used. An Administrator view the list of un reviewed devices corresponding to a User from the below screen. An Administrator can view all the configured MFA (Multifactor Authentication) methods corresponding to a particular user. Administrator can find more details on the configured MFA option. In oreder to get those details,click on MFA method. For More information click here. Administrator can see the accepted user consent details by logging in to your business portal. By clicking on the view button, the administrator can view the corresponding accepted consent pages. Click the Delete User button to permanently remove the user from the cidaas portal. An administrator can temporarily revoke the access to the cidaas portal for a user. The user will not be able to login to the cidaas portal when the account is deacticated. 1 . In the User Search screen, go to the User Search Grid. 4 . Click Deactivate to confirm. Note: You can also deactivate a user from the User Information panel on the User Details screen. Refer to the User Information panel section. An administrator can change a user status from Inactive to Active status. Note: You can also activate a user from the User Information panel of the User Details screen. Refer to the User Information panel section. If the user is unable to access a verification Email, then an administrator can resend the verification email to the user from through theActions* menu. 4 . In the Resend Verification Email screen, select the Client ID from the list. 5 . Select the Redirect URL from the list. 6 . Select the process type (Link or Code). 7 . Click Send. The verification email is sent. For a registered user, if the required client code/action was not processed during the first Webhook trigger, then you can resubmit the Webhook. 2 . For the user to be activated, in the Actions column, click …. 3 . Click Submit User Data. 5 . The user data is submitted successfully.